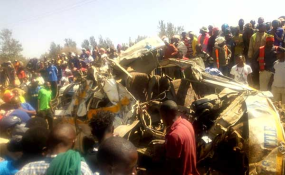 The scene where more than 10 people were killed on March 22, 2019 after a truck and a 2NK shuttle collided at Kikopey on the Nakuru-Nairobi highway. Twelve people have been killed after a truck and a 2NK shuttle collided at Kikopey on the Nakuru-Nairobi highway. Gilgil OCPD Opuru said that emergency teams had been sent to the scene of the Friday morning crash. Nakuru County Police Commander Stephen Matu confirmed that all 11 passengers who were in the 2NK shuttle died on the spot. Another passenger died later at the Gilgil Sub-County Hospital. Those who died were seven women and five men. The driver of the truck escaped while his turnboy suffered serious injuries. According to the police, the lorry was speeding and the driver lost its control. It then collided head on with the matatu which was heading towards Nairobi. Nakuru County Commissioner Erastus Mbui, in a press briefing, said the crash involved five vehicles. Mr Mbui said the truck's brakes failed while it was descending the climbing lane towards Nakuru. It then hit two canter lorries before colliding with the matatu, killing all the passengers. He added that the lorry then veered of the road and ran into a compound near the road. Three vehicles were extensively damaged and were towed to Gilgil Police Station.